Komajiro's pursuit of his brother brought out his ferocious tiger spirit. he even has stripes! According to the Yo-kai Encyclopedia, "Komajiro's pursuit of his brother brought out his ferocious tiger spirit. He even has stripes!" Yo-kai Medallium Bio: Komajiro's pursuit of his brother brought out his ferocious tiger spirit. he even has stripes! 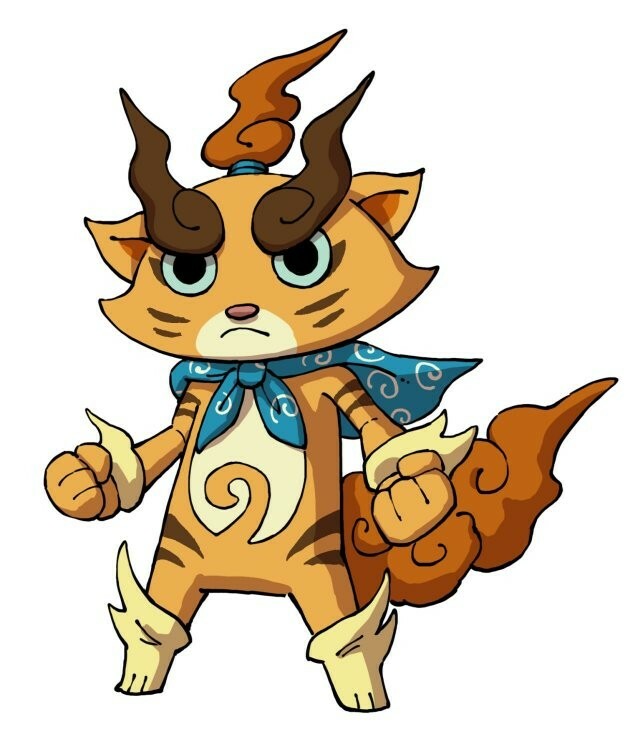 A pale-orange, tiger-like Yo-kai with big, pale blue eyes encircled by dark brown markings that resemble tiger stripes, as well as brown whiskers, and stripes on his arms and hips. His inner-ears are orange, while his chest and muzzle are cream colored. He has a brown flame-like ponytail and tail. Similarly to his previous form, he has long brown, flaming eyebrows. Wisps of beige are on his wrists and feet. The pouch from his prior form have become a short cape. 'Tora' is the Japanese word for tiger. 'Jiro' means the second eldest son.